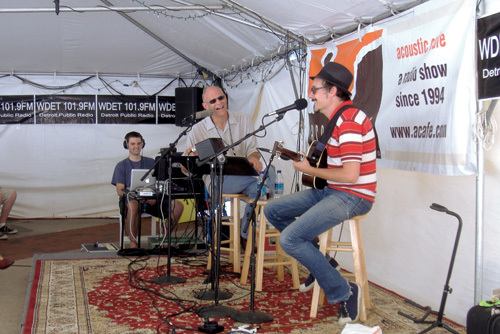 ABOVE LEFT: Reinhart, left, with Willy Porter at a live broadcast in 2010 at the Ann Arbor Summer Festival. RIGHT: Reinhart (in sunglasses) with Richard Julian at the Ann Arbor Summer Festival, 2010. If you’ve never heard music by Sarah Jarosz or Dale Earnhardt Jr., you’re not alone. It’s difficult for a new artist — even one who’s been around but doesn’t fit a certain formula — to break into today’s mainstream commercial radio, where playlists are demographically engineered and such pop mainstays as Kelly Clarkson and Brad Paisley rule. Having spent a career in the business, Rob Reinhart understands the vagaries of radio. 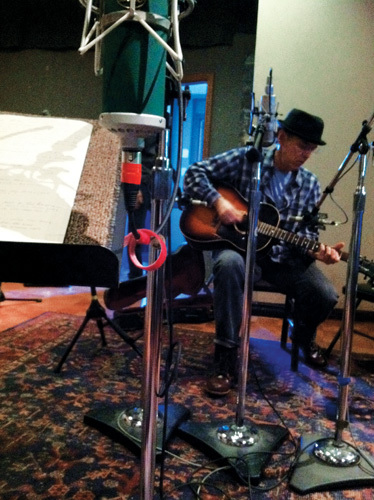 But as executive producer and host of Acoustic Café, a weekly two-hour program produced in Ann Arbor and syndicated worldwide, he’s defying conventional wisdom. 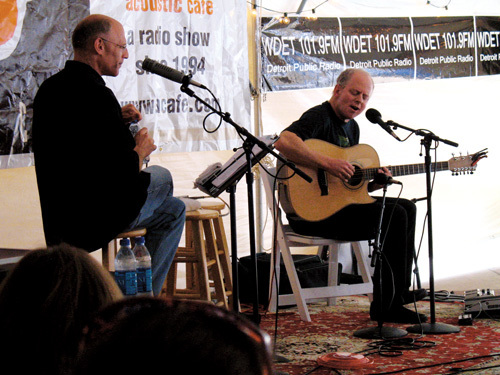 Acoustic Café has put new and interesting music on the radio every week for more than 17 years and has managed to be a commercial success in the process. Reinhart became interested in radio at an early age. “I grew up with the Big 8 [CKLW] and I was hooked,” he says. “When I was a little kid, guys would play army or cowboys and Indians and I would play radio in my room.” That early interest led to stints at the University of Michigan’s student-run radio station, WIBM in Jackson, and WIQB in Ann Arbor. Reinhart also ran Ann Arbor advertising agency RM&M (now RDR Radio, LLC) from 1985 to 1990, winning five Addy awards along the way. For 12 years, he produced edgy and sometimes gross-out commercial parodies (“Little Sneezers Pizza”) for 1,500 U.S. radio stations. Acoustic Café was born at the height of the unplugged music movement that drew in a range of artists from Stone Temple Pilots to Eric Clapton. “I was still working at WIQB doing a show called Sunday Morning Unplugged,” Reinhart says. “It allowed me to try out all this stuff that was threatening to the mainstream at that time, like Shawn Colvin and John Gorka.” That show’s popularity led Reinhart to believe that the same concept, with the added feature of an in-studio guest, might work on a national basis and, in January 1995, Acoustic Café debuted. “Our goal was to be the most commercial thing on non-commercial radio and the least commercial thing on commercial radio,” he says. Each show blends music from Reinhart’s extensive personal collection, intimate in-studio performances, and conversation that examines the artists’ creative process. “It’s nice to hear an artist with just a guitar and Rob’s well-thought-out questions,” says guitarist and songwriter Martin Sexton, who has been a frequent guest. Reinhart is still incredulous when he recalls Acoustic Café’s early years. 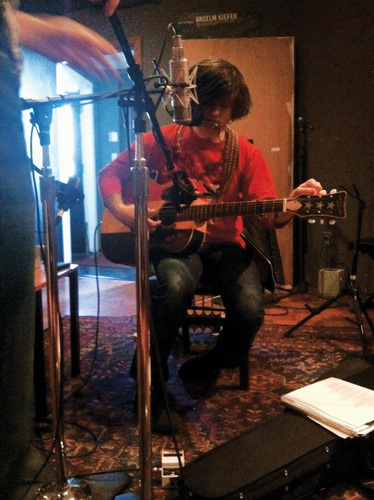 “We had people do in-studio sessions that I never would have imagined, like John Prine. We only had 15 or 20 affiliates. He shouldn’t have done the show, but he was kind enough to do it,” he says. Today, Acoustic Café airs on 85 commercial and non-commercial radio stations, including WRLT-FM in Nashville, a town that knows a little bit about music. “We think highly of it in Music City,” says David Hall, WRLT’s program director. “It stands to reason that, in a city full of singer/songwriters … the organic nature of the program would work here in Nashville.” Acoustic Café is also heard around the world on Voice of America. As the show developed, the original concept of simpler, stripped-down content began to broaden. “We really wanted to highlight songwriters and whatever genre they were working in, [so] the instrumentation started to fade in importance,” Reinhart says. “ ‘You want to play electric guitar? 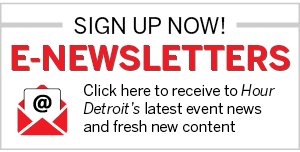 Fine, we just want to hear your songs.’ ” As of early this year, Reinhart had produced 891 shows with guests ranging from Beck to Steve Martin (yes, that Steve Martin) and the Steep Canyon Rangers bluegrass band. Asked if he can take credit for discovering an artist, Reinhart demurs, allowing only that he was the first person to interview Norah Jones on her inaugural tour. “I was more touched by the fact that we were the last thing Rick Danko did before he died,” he says. Reinhart shows no signs of slowing down. 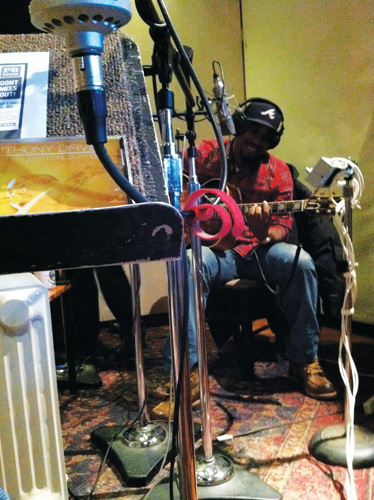 In addition to producing the weekly show, he took Acoustic Café on the road in February, hobnobbing with music-industry insiders and recording performances at the International Folk Alliance Conference in Memphis. For the second year, Reinhart created a promotion for The Ark in Ann Arbor to increase awareness of the Ann Arbor Folk Festival. And then there’s Rob Reinhart’s Essential Music, which airs Saturday afternoons on WDET. Whatever the future holds for Reinhart, it will be all about the music, and it will turn convention on its head. 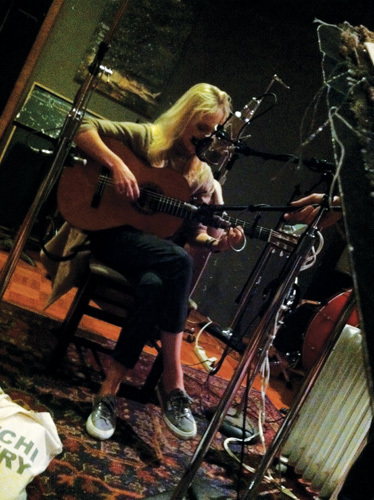 If Kelly Clarkson ever channels Joan Baez, you might hear it on Acoustic Café. “There’s nothing I like better than when an artist comes along with something really new and different,” Reinhart says. 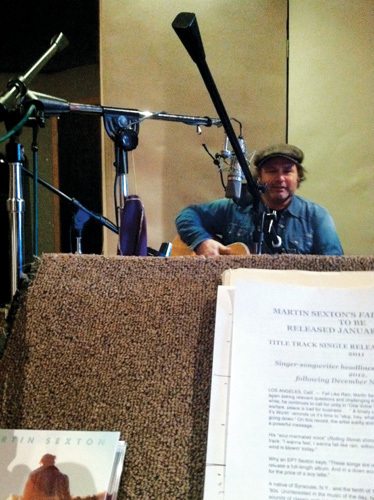 BELOW: Studio guests (from left) Anthony David, John Hiatt, Laura Marling, Martin Sexton, Ryan Adams.